Owned by the Director of Projects Abroad Ecuador, William Puga, and partly funded by Projects Abroad itself, a new nursery is well on its way to housing some of the Galapagos’ most precious plant species. Situated in the Highlands of San Cristobal, not far from El Progresso Village, the nursery will be home to endemic plants and trees of the Galapagos. 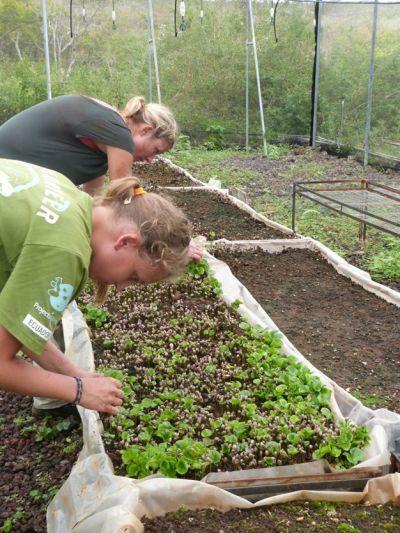 The Galapagos National Park, a Projects Abroad partner, will provide plants for the nursery and provide assistance and guidance to volunteers during the development stages at the nursery. However, Projects Abroad will have full control of the nursery, and as an organisation will be able to create a lasting conservation influence in the Galapagos by doing similar work to that of the Galapagos National Park and the Charles Darwin Foundation (based on the island of Santa Cruz). One of the main tasks for Conservation volunteers is to get rid of invasive plants which are harmful to endemic species. These endemic species are being planted at the new nursery with limited amounts of pesticides. Volunteers have been involved in building, planting and maintaining the nursery from the start. William is also excited that Projects Abroad volunteers and the local community are included in the final plan to create awareness and to protect the indigenous plant species in the Galapagos. To achieve this, an environmental and conservation awareness centre, along with an eco-camp for all Conservation volunteers, will soon exist. What is the future for the project? At present, the nursery section is complete and volunteers regularly help to maintain and plant species such as the miconia (Miconia vesca). William anticipates that the building will be completed in three to six months. ‘We have the ecological reserve set up. We also hope to have it as the base for the Conservation project.’ Eventually all Conservation volunteers will be housed at the eco-camp and will be able to fully immerse themselves in Galapagos conservation by being steps away from their very own nursery and environmental centre. Read more about the Ecuador Conservation Project.